CarbonCopy is tool witch cration of spoofed certificate is very easy. 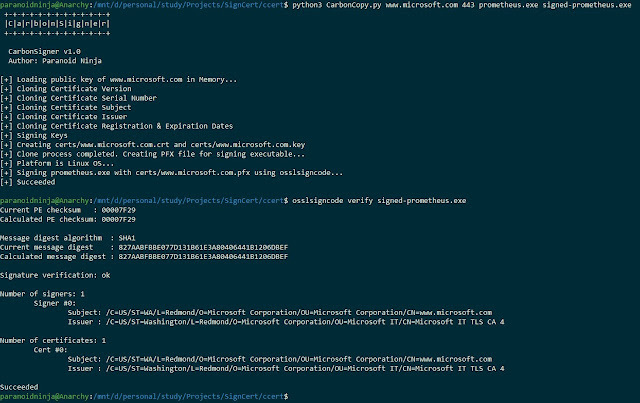 Copy all properties of certificate, sign executable. Although we can secure the private key and with a password, it is still not very secure as anybody who get access to our PC can steal them. We can extend the security by encrypting the filesystem (eg. ecryptfs, dm-crypt) and allow to decrypt it only when we login. Yubikey NEO provide a platform-independent API to cryptographic tokens via PKCS#11 standard. That makes the Yubikey to work like a smart card. Access to the PIV interface is secured by a PIN - only person who knows the password can use the Yubikey to authenticate. import the user's certificate (user_cert.pfx) into the Authenticate slot (9a). If the PUK is blocked (3 unsuccessful attempts), the PIV applet will be blocked and we need to reset it (see above). UPDATE 02–19–2017: The laika-bro-client.py script referenced below is now on Github. The development environment for this project is pretty simply: two Ubuntu (14.04.5) systems located on the same subnet via a private virtual network. Since this setup is only for development, the systems have a minimum number of cores (1) and the default amount of memory (1GB). The client system — which represents a Bro sensor — has Bro 2.5 installed and the server system — which represents a Laika cluster — has Laika installed and running as a service (laikad in asynchronous mode). Effectively, the server is waiting for something to send it files to process. But how can we do that? To get files to the Laika server, we have to first get the files. Files are sent across the network all the time, so why not start there? Bro is a great choice for extracting files from network traffic because it can identify files across multiple application layer protocols (HTTP, SMTP, FTP, etc) and natively supports file extraction. To get the files we want Laika to process, we just need to have Bro extract them. The script above does just that — Bro will extract every file it sniffs (so long as the file is under 10MB in size) and save it to the/tmp/monitor/ directory on the client (this is the staging directory that we’ll monitor separately). This script is effective for development, but also dangerously simple — even in small production environments, I would expect this script to extract hundreds-to-thousands of files each day. This is the first bottleneck in this whole process: if Bro is extracting too many files, then our downstream processes (file transfer, Laika scanning) will get uselessly backed up. To make the script more effective, we should only be extracting files that Laika can either derive metadata from (e.g., PE files) or files that need to be scanned with Yara. The easiest way to do this is to use Bro’s file mime type identification (meta$mime_type) and only extract files that Laika can identify. Also, be sure to skip extracting very large files (f$seen_bytes) — you don’t want to be reading 1GB files in Python and trying to send that across your network. Now that we have files, we just need to figure out how to get them to the Laika server. (Remember, the server is running asynchronously — it’s just waiting for files to arrive.) Solving this piece was the most complicated part of this project — it’s relatively easy to get the files to the server (thanks, Python! ), but doing so efficiently is another story. For this, I considered that in most networks Bro sensors would likely be sniffing and extracting lots of files — so we should expect to be sending large batches of files to the Laika server. Laika comes with a script that accounts for this (cloudscan.py), though it’s used in a different context (the server sends scan results back to the client because the client is expected to be a user waiting in a Terminal); for our use here, we just need to get the files to the server (no need for a response). cloudscan.py handles this with multi-processing (mp) and taking a similar approach here proved effective in my tests. Main function runs the scheduler. Function that verifies a file exists. assigned a random worker number. Every file that is processed for transfer runs through the sanity_check function to make sure it still exists (if it doesn’t, then the file is popped out of the queue and nothing happens); there’s also a try/except inside the file transfer function to catch any file that may have somehow passed sanity_check. However, I only ran into this issue when I went looking for it: using a PCAP from the 2012 MACCDC as a test, I extracted 3030 files with Bro to /tmp/monitor/ and set the script to kick off file transfers every second. This had the expected effect (the transfer function kicked off multiple times before previous file transfers could finish and tried to transfer files that no longer existed), but is so far out of the norm that under normal use, this shouldn’t happen. Another thing worth mentioning is that this script doesn’t protect you from shooting yourself in the foot: it always deletes files after it tries to send them (even if the file transfer fails! ), it doesn’t have file size restrictions, etc. These are things I’ll likely go back and add later. Here’s what this actually looks like running on the VM systems. The VM on the left is the server (running the laikad service in the bottom Terminal) and the VM on the right is the client (running laika-bro-client.py in the bottom Terminal). The images are before and after shots of what happens when Bro is executed on the client and files are sent to the server.